Positive waves in the market. Read to find out more that occurred during the past one week. In the past week, all the broader market indices and sectoral indices were traded in green. The market witnessed an upward movement. Throughout the week, Sensex hits a new record high, and then further hits previous day’s high. GST rate curtailment, rally in FMCG, consumer durable, and banking stocks, value buying in large-cap stocks, solid growth in corporate earnings, firmly global cues, and capital infusion by FIIs brought in such growth. Let’s get into depth to find out more about the past one week. Market closed higher this week. 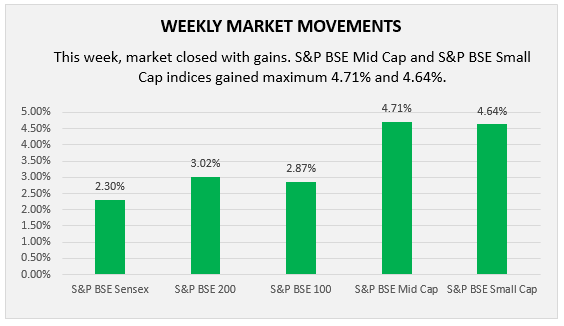 Both S&P BSE Midcap and S&P BSE Small cap traded up by 4.71% and 4.64%, resp., while large cap indices Sensex, BSE 200 and BSE 100 gained 230%, 3.02%, and 2.87%, respectively. On the first trading day, Sensex scaled a record high of 36749.69 during intra trade and closed at 36718.60 points. It is because the GST rates cut on white goods from 28% to 18% brought in the rally in FMCG and banking stocks. Gains were further increased because the ruling government won the no-confidence motion; however, escalating trade war concerns restricted some profits. Again, the next day, Sensex opened higher at 36859.39 scale and soared to a fresh record high of 36,869.34 points. Higher corporate earnings, rally in banking, FMCG, consumer durables, IT, & auto sectors and positive global cues boosted the investors’ sentiments. However, these gains were restricted because of probable increase in repo rate to 6.50% in upcoming monetary policy committee meeting. On the third consecutive day, the market continually followed the same trend and hits an all-time high at 36947.18 points. Investors remain cautious due to upcoming release of company’s quarterly earnings results. On Thursday, market again broke the previous day’s record and closed at a fresh record high of 36984.64. During the intra-day trade, it reached to an all-time high of 37,061.62. Solid earnings results and persistent demand of bluechip stocks were the prominent reasons. Moreover, zero tariff deals signed by the US President and EU officials increased the gains. Last day, Sensex closed higher at 37,336.85 with a record high of 37,368.62 due to value buying in large-cap stocks, optimism earnings results, favourable global cues, and capital infusion by FIIs. 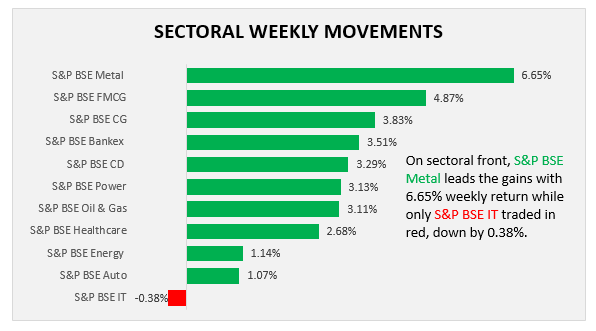 Sectoral Indices were traded in green, among all, S&P BSE Metal remained the top performing sector which traded up by 6.65%. 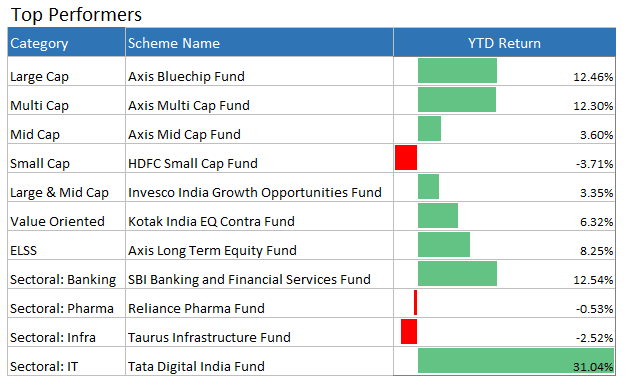 On the index, 9 stocks advanced while only Coal India showed marginal decline by 0.46%. However, revised GST rates brought rally in FMCG and consumer durable stocks which traded higher by 4.87% and 3.29%. Buying interest in banking stocks and capital goods traded higher by 3.51% and 3.83%, respectively. S&P BSE Oil & Gas closed up by 3.11% because of eased trade tension and temporary shutdown of Saudi Arabia’s crude oil supply lane. S&P BSE Power and S&P BSE Healthcare sector were closed at a weekly gains of 3.13% and 2.68%, respectively. 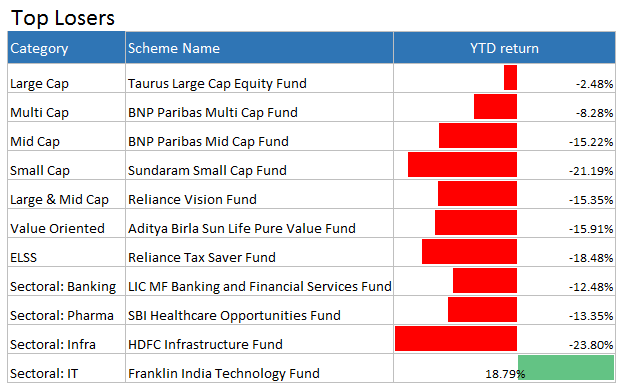 On the sectoral front, there is only one sector, i.e., S&P BSE IT which was traded in loss, down by 0.38%. On Friday, the rupee depreciated to 68.6249 USD that dampened investors’ sentiments. With this, we are now winding up our analysis for the past week. We hope things will remain positive in the future as well. To seek assistance concerning mutual fund investments, consult our in-house financial experts or keep on following all the suggestions we make through our blogs section.